Did you know there are new soccer teams in the area? The Chain of Lakes Soccer Club is a brand new edition to the youth sports scene in the ROCORI community. Check out this video of the girls team and coach Susan Knutson as they rallied agaianst Sartell last week. It was a night full of turnovers for the Rocori Spartans. The four fumbles, one interception and the first quarter safety were just too much to overcome when the Spartans hosted St. Cloud Tech here in Cold Spring. Even with junior running back Alex Jungels 110 yards rushing, the Rocori grid iron fell short in their 28 to 44 loss to St. Cloud Tech. Cold Spring hosted the volleyball match this week with the Buffalo Bison. It was a back and forth match that could of easily got the Spartans way but in the end the Bison won the match. Key player performances were made by Brittany Schlangen who had 11 kills and 23 digs, Shelly Tippelt had 7 kills and 3 ace blocks and Kaitlin Griffin delivered 7 kills, 9 digs and 2 ace serves. The Spartans hosted the Rocori Cross Country Invitational this past Thursday at River Oaks Gollf Course in Cold Spring. The participating schools included Alexandria, Fargo South, Little Falls, Rocori, Sauk Rapids, St. Cloud Apollo, and St. Cloud Tech. Fargo South had a strong showing in both the boys and girls races with six runners in the top 9 positions for the boys and places one, two and three in the girls. The Rocori boys placed 5th among the seven teams and the girls also placed 5th. One shining Rocori star during the meet was freshman Caitlyn Dingman who placed fourth only one second behind the third place Fargo South runner. 1993 Rocori High School graduate Cory Schreifels was inducted into the University of Minnesota-Crookston Athletic Hall of Fame this past Friday. Schreifels is a 1998 graduate who played football for UMC. He holds the single season sack record and was chosen twice on the first team all-conference selection and two times on the first team NAIA All-American team. Rocori graduate Katie Kremer is a stand out freshman player on the St. Thomas volleyball team. This past week she had 22 digs during a meet against the College of St. Benedict. St. Thomas won the match. Richmond native Brad Schramel continues to be a stand out athlete now competing in the World & Amputee Games in Brazil. Schramel is a member of the USA Wheelchair Rugby Team. Brad, who suffered a spinal injury in a motorcycle accident in 1991 was paralysed from the midchest down. For the past 3 years he has played for the Chicago Bears rugby team. Schramel plays primarily defense on a 14 member team roster. On Saturday, October 15th, three new members will be inducted into the Rocori Hall Of Fame. The Coaches Association has chosen Kirby Dahl, John DeLozier and Sandy (Fuchs) Dingman. The induction ceremonies will be held at River City Grill in Richmond. Tickets are available in the Rocori High School Activities Office. The Cold Spring City Council adopted their preliminary levy and budget recently. The equal or less than levy is primarily due to the cities contined growth. The Cold Spring Lions and the city are working cooperatively to replace the present information sign in downtown Cold Spring. The goal is a new electronic sign that has a sizable budget figure. To help make the sign a reality, the Lions and City are looking for up to four business sponsors who will share advertising space on the sign for a period of 10 years. For more information contact City Hall or Mike Weber, Lions President. Duane Kuss, Cold Spring, has started DigElogrocori, which is a Web site of vlogs. They are short video stories about the people and happenings around his town. 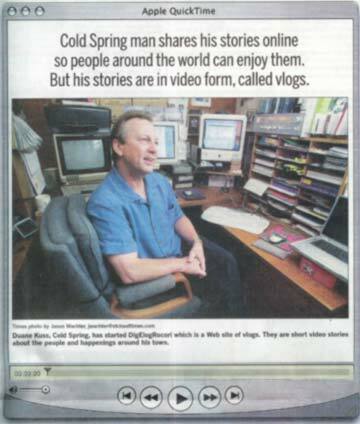 COLD SPRING - Duane Kuss started a mini-media empire in Central Minnesota this summer. The Cold Spring resident was goofing around on his computer in May when he came across a video log, a collection of short pieces of video footage that tells a variety of stories. He was intrigued by the technology, and found a Web site that explained how to create a video log - or vlog. It's time to head out to local orchards and pick up your favorite apple variety. Take the whole family along for a fun time taste testing different varieties to find the perfect apple for your families Fall enjoyment. There was a fire at the Randy Libbesmeier home this past Monday evening at 5 pm. The fire began in the garage when a car started burning. Rockville Fire Chief Randy Dingman reported that no one was injured but the damage sustained by the house was enough that it could no longer be inhabited until repairs were made. It appears the trend of families and students moving out from the St. Cloud school district to other schools continues. St. Cloud, which has declined in enrollment by almost 2000 students since 1998 again dropped this year for the 8th consecutive year. The Rocori school district grew near 1 percent again this fall. Evens, Guy and Jennifer; Richmond; girl; Friday, Sept. 16, 2005. Humbert, Nathan and Jennifer; Cold Spring; girl; Saturday, Sept. 17, 2005. Paulson, Eric and Sara; Cold Spring; girl; Saturday, Sept. 17, 2005. Callais, LeRoy and Dianna; Richmond; boy; Monday, Sept. 19, 2005. Michael and Candice Voigt, who reside in Cold Spring, announced the engagement of their daughter, Shalynn, to Jamie Benson, son of Mark Benson of Sartell and Cheryl Benson of St. Cloud. Shalynn Voigt graduated from Rocori High School in 1998, Cold Spring, and in 2004 graduated from Regency Beauty Academy. She is presently employed by Headlines Salon & Spa in Sartell. Jamie Benson is a 1999 graduate of Sartell High School and a 2003 graduate of the graphic design and computer animation program at Brown College. He is presently employed by Ink Systems Inc., St. Cloud. The wedding is planned for October 8th.